SMUTEYE -- It is that time of year again. Fall is in the air, and it will soon be time to celebrate the beginning of Hog Killin' Time in Smuteye. Many of you reading this invitation know the story of how this event came about. Early last century Major's great grandfather also named Major, established the Hog Killin' Time Barbecue to celebrate his grandson, Charles' birthday. He would invite local farm workers and use the feast to recruit some of them to help harvest his cotton crop. Today, we continue the tradition with our fall gathering of friends to share food and friendship. Hurricane Ivan blew over lots of hickory and oak wood, which is cut and stacked by the pit. Wayne Jones returns to head the team of Pig Roasters and will be assisted by John D. Cox. Roasting will start Friday evening and will take approximately 14 hours. You are invited to bring your camping gear and join these brave souls who will spend the night camped around the hickory and oak bonfire that produces coals for the pit. Let us know if you would like to camp overnight! 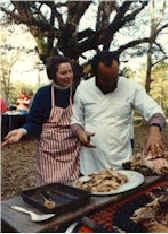 Over the years, several thousand people have trekked to the Cox Plantation in Smuteye, Alabama to attend this barbecue. Expect to spend an afternoon among old and new friends, eating great food and enjoying fun-filled autumn activities. We'll open the gates and begin the hospitality around noon. As in the past, the property will be open for tours and hikes. We encourage you to explore the out-back trails. The pork procession, followed immediately by the traditional photo and feast, will take place at 2:30 pm on Saturday. Margaret will continue the tradition of firing-up her 80-gallon iron caldron to create her Fabulous, Four-alarm, Fifty-gallon chili. In addition, guests are invited to bring salads, vegetables, desserts, and beverages to add to the banquet. We will light the bonfire as soon as temperatures allow. Peanuts and apples to feed the horses will be available. Be sure to bring your appetite!